to Speak on "The Neurology of Human Nature"
The Farquhar College of Arts and Sciences Division of Social and Behavioral Sciences welcomed renowned neurologist Vilayanur S. Ramachandran, M.D., Ph.D., to Nova Southeastern University as part of the college's 2010-2011 Distinguished Speakers Series. His talk was titled "The Neurology of Human Nature." Ramachandran is best known for his work in the fields of psychophysics and behavioral neurology, as his experiments have left a profound impact on how scientists view the brain. He is currently the director of the Center for Brain and Cognition in the Psychology Department and Neurosciences Program at the University of California-San Diego and adjunct professor of biology at the Salk Institute for Biological Studies. 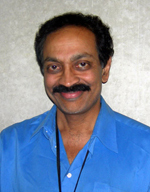 Ramachandran's work has focused on the study of visual perception using the methods of psychophysics and the study of neurological syndromes and autism. His experiments are known for their simplicity and the use of low-tech equipment to answer questions about how the brain functions. He is credited with introducing the use of visual feedback (a mirror box) as a treatment for phantom limb pain (when a patient feels the presence of a missing limb), rehabilitation after a stroke, and RDS (complex regional pain syndrome). His research into phantom limbs suggests that the syndrome might be caused by changes in the brain rather than in the peripheral nerves. His study of synesthesia, a condition in which individuals observing black and white letters or numbers on a page see them in color, suggested that the condition might arise from a similar cross-activation between brain regions. Ramachandran initially trained to become a doctor and obtained a medical degree at Stanley Medical College in Madras, India. He earned a doctoral degree from Trinity College at the University of Cambridge. In 1995, he delivered the "Decade of the Brain" lecture at the 25th annual meeting of the Society for Neuroscience. He is the co-author with Sandra Blakeslee of Phantoms in the Brain: Probing the Mysteries of the Human Mind, a book published in 1998 that was translated into nine languages and formed the basis for a PBS television special. He has published more than 180 papers in scientific journals, including five invited review articles in Scientific American. Ramachandran has been elected to fellowships at All Souls College, Oxford, and Stanford University. He was awarded an honorary life fellowship by the Royal Institution of Great Britain, which also awarded him the Henry Dale Medal in 2005. In 2003, he became the first physician/psychologist to give the Reith Lectures, a series of annual radio lectures commissioned by the BBC. In 2007, the president of India conferred upon him the title of Padma Bhushan, the second highest civilian award and honorific title in India. Newsweek magazine named Ramachandran one of the 100 most prominent people to watch in the 21st Century. Time magazine named him one of 2011's 100 most influential people in the world. As part of its mission to prepare students for professional careers and active citizenship, the college frames co-curricular programs and experiences around an annual theme that unites our community in multidisciplinary exploration. The academic theme for the 2010-2011 school year was "Identity." Ramachandran was the fourth distinguished speaker to address that theme this year.